Chloramphenicol Antibiotic Eye Ointment for acute bacterial conjunctivitis. 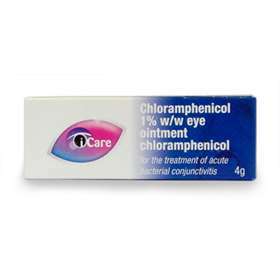 Chloramphenicol is an antibiotic ointment which treats simple eye infections such as acute conjunctivitis. This bacterial infection is sometimes known as 'red eye' as the usually white area of the eye turns red. A sticky discharge may appear in the mornings which can make the affected eye difficult to open. A course of treatment lasts 5 days - Apply about 1cm of ointment to the affected eye(s) 3 to 4 times a day. Contact should not be worn during the course of the treatment. Do not use the ointment if you are allergic to any of its ingredients. Do not use if you or your family has had problems with their blood or bone marrow, these problems can include a severe reduction in red blood cells or lower than normal blood count. See you doctor immediately if your eye is painful (rather just just feeling sore or gritty) or you have pain or swelling around the eye or face. Speak to your doctor straight away if you sight is affected by loss of vision or you see halos around lights. Seek medical advice immediately if your pupil looks different, if you eye is cloudy, you have had an eye infection in the last month, you have glaucoma, you have dry eye syndrome, you have injured your eye, you think there may be something in your eye, you are already using other drops or ointments or if you have had laser surgery on your eye in the last 6 months. Chloramphenicol 1%, Liquid Paraffin, Wool Fat and Yellow Soft Paraffin.